Boxing Channel offers pre-fight coverage, including interviews with the ageless legend Bernard Hopkins, his challenger Chad Dawson, promoter Oscar De La Hoya and footage from press conferences leading up to the WBC light heavyweight championship bout. Go to Boxingchannel.tv, the only web destination to offer wall-to-wall video coverage of the sweet science, for postfight coverage as well, with expert analysis from Dave Bontempo and Marcos Villegas. Esteemed boxing analyst Al Bernstein is the executive producer for The Boxing Channel and contributes video blogs on http://boxingchannel.tv/ which feature his signature brand of commentary and knowledge accumulated over decades in the business. Boxingchannel.tv is also home to an extensive library of classic fights, spotlighting champions like De La Hoya, Roberto Duran, Juan Manuel Marquez and Marco Antonio Barrera. Fresh video content, updated constantly, crafted by some of the best boxing media working today--the boxingchannel.tv has emerged as a must-visit destination for fight fans. Boxing Channel will also bring you coverage of the press conference for Mares-Agbeko II that will be taking place today (Saturday, Oct 15th) at the Staples Center in Los Angeles. Make sure to log on to our sister site TSS NEWS on saturday night and get a round by round description of the Hopkins-Dawson fight by Ray Markarian; and great post fight expert analysis from TSS stalwarts David Avila, Ron Borges and Frank Lotierzo. 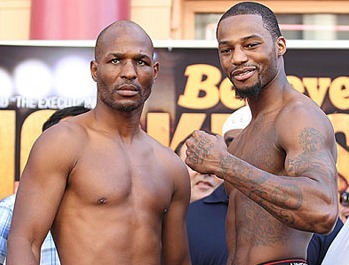 Chad Dawson "Bernard has done some great things but its my time now!"